Here I'm sending you a short message that the launch has successfully done. CINEMA 2 and 3 were deployed after ~900 seconds from the launch. We will stay until the first contact and might send you cinema all E-mailonce we capture the beacon signal. Everything is good so far and hope I can e-mail you soon. Congratulations to all CINEMA team members and everyone involved. Great news. More on this in due time. 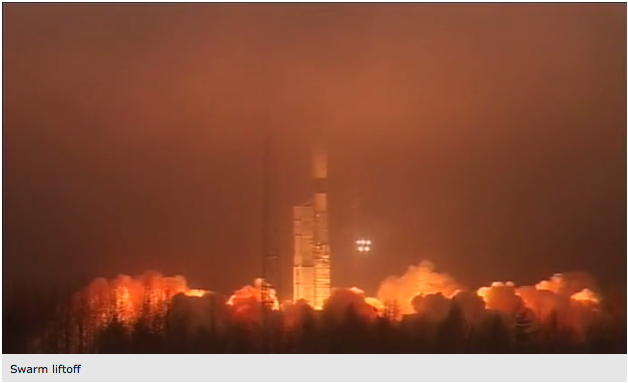 Kosmotras launched a Dnepr rocket from Dombarovsky on Thursday, carrying the United Arab Emirates’ DubaiSat-2, thirty one other satellites – including Peru’s first satellite – and one attached payload. The mission set new records for the most payloads carried into orbit by a single rocket and the smallest satellite ever launched, following lift off at 13:10:16 local time (07:10 UTC). KHUSAT-1 and 2, also designated CINEMA-2 and 3 respectively, are South Korea’s contribution to the international CubeSat for Ion, Neutral, Electron, Magnetic fields, or CINEMA, programme. Developed by Korea’s Kyung Hee University, the satellites carry magnetometers produced by Imperial College London, in the United Kingdom. The CINEMA programme is led by the University of California, who provided the CINEMA-1 satellite that was launched on an Atlas V rocket last year. NASA’s Ames Research Center is also involved in the programme, and launch services for CINEMA-1 were procured through NASA’s ELaNa CubeSat launch programme. Three-unit CubeSats with masses of four kilograms (8.8 lb), the two KHUSATs carry two instruments; the Magnetometer from Imperial College (MAGIC) is used to characterise the Earth’s magnetic field in the satellite’s vicinity, while the Suprathermal Electrons, Ions and Neutrals (STEIN) experiment will detect energetic particles around the spacecraft. Esp. the STEIN experiment is relevant to EISCAT, and joint experiments are planned within EISCAT's Peer-Review Programme. Yesterday evening, 18th November 2013, we got the news that the EISCAT_3D project was accepted to be part of the Finnish National Roadmap for Research Infrastructures. While this decision does not imply funding, it is a crucial step towards future funding. Furthermore, this is great news for all partners, because it shows that another country considers EISCAT_3D a worthwhile endeavour to be considered when building the research infrastructures of the future.